With the feisty lyrics of American rap legend Tupac pumping out of the car stereo, 36-year-old Steve Okoikpi manoeuvres his only-slightly ageing Mercedes Benz through sharp bends on the road. The destination is Akasanko, a forest community of about 500 people in the outskirts of Calabar, the capital of Cross River State. Cross River lies on the coastline of Nigeria’s oil-rich, but heavily impoverished Niger Delta region. Some 30 minutes later, Steve is welcomed in Akasanko by traditional music blaring from a loudspeaker in a beer joint. It is morning, and scores of youths are huddled over bottles of beer and steaming plates of goat meat pepper soup. On hand to welcome Steve is the chief of the community Edet Offiong, alongside some youths. According Steve this sort of respect is important, and the villagers know it. 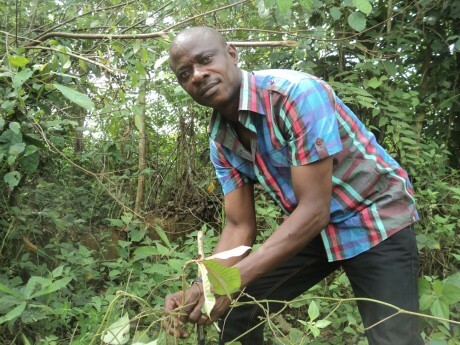 As project officer at the Cross River Forestry Commission, Steve is one of the government officials charged with ensuring that a programme for conserving the forests is implemented. He works in tandem with a Forest Management Committee, which is made up of, and run by, members of the community. Inside the forest, which looks somewhat naked on account of the many trees that have been felled for firewood, Steve makes the rounds inspecting nurseries, and lecturing youths on why the forest must be regenerated. His voice mingles with the hooting of birds, and the noise of a lone pineapple farmer tending his crops. The farmer, Steve says, is allowed to grow pineapples because he agreed to help tend the nurseries and take care of young trees. Everyone else has been shut out. “Three people who entered this forest for game and to cut wood were arrested and prosecuted last year,” begins Steve, his eyes flashing authoritatively. Carbon concession is a climate change mitigation strategy. Forest communities and businesses agree plans to conserve trees which absorb carbon dioxide, rather than chopping them down. From the United Nations Reducing Emissions through Deforestation and Degradation (REDD) programme, Nigeria recently netted $4million to carry out “REDD readiness,” a series of workshops and campaigns aimed at forest communities and oil companies. The aim is to help them get to grips with conservation and curbing carbon emissions. Most of the UN REDD money will be poured into Cross River, a reward for what its officials describe as government’s ‘conscientious efforts to save the forests’. 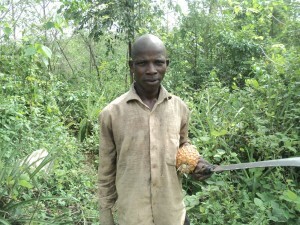 Many on the ground are already aware of the REDD money and expectations are massive. In a country that has lost over 70 per cent of its forest cover, Cross River has been recognised as the ’environment capital’ of Africa’s most populous nation. It plays host to over 50 per cent of Nigeria’s last standing rainforests. And the government is fighting to continue protecting the forests, and projecting the image that it is doing so. Chief Edet, who heads the Forest Management Committee in Akasanko, seems eager to drum up support for what the government is doing. He doesn’t expand upon the project except to say everything is going well. And from the way other villagers pay obeisance to Steve it appears, on the surface at least, that they have fallen into line. The fear of prosecution for those caught engaging in illegal activities inside the forest is real. A forestry law of 2010 imposes heavy fines and jail terms of up to two years on villagers who make unpermitted forays into the forests. 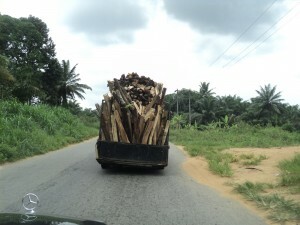 But illegal logging still goes on, showing that a good number of people have not been persuaded.. .
Arikpo Arikpo, a member of the Cross River Forestry Commission, says the major challenges are poverty and a lack of alternatives. 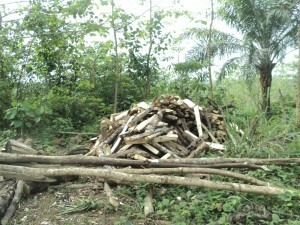 “This was not just challenging in terms of livelihood, but also in terms of access to wood for basic activities. People are not so ignorant; they know the value of the forests and, all their life, they have been dependent on it. “What we have done in our area is to earmark some areas for farming. That is what we have called land use plan, and it has really worked well, such that we now know where to farm and where not to. However, Edwin Usang, Executive Director of the Calabar-based Coalition for the Environment is hesitant about rolling over to praise the government. He thinks not enough is being done to provide alternatives and, as a result, people have continued to undermine the government’s efforts, albeit surreptitiously. One of the major talking points at the climate talks in Durban last December was how to ensure that money from international climate financing initiatives reaches the ground. In fact, the need to dissuade the poor man with an axe from chopping down a tree was frequently evoked in discussions. In Cross River, many people in forest communities are eagerly awaiting money from projects like UN REDD as a way of alleviating their poverty, so they can leave the forests to breathe, and mitigate climate change in that small but significant way. Thanks very much. I´m a spaniard living in the north of Esmeraldas, Ecuador. Here the jungle is daying while african palmtrees plantations are growing all around. Polouted rivers because of the minery. Politicians and afroecuatorian people call it developement. Local population selling the land. Tvs, and hi fi equipments maximum volume, salsa and ragueton music everwhere. They call it progress. What can we do? I can bet with a million dollar that gross coruption in most African countries, particularly Nigeria, where I hail from, will not permit the UN REDD money to reach the “ground”, that is commonities and farmers living in forest areas. In Nigeria, for instance, the cost of kerosine-the major cooking fuel- has gone up, leaving the rural people with no other alternative than “FIRE WOOD” for cooking their meals. As long as the cost of cooking oil continues to be out of the reach of the ordinary man, he would have no other alternative but a recourse to the use of fire wood which nature has provided in abundance but sadly is depleting.